With their sleek styling, powerful performance, and bold innovations, it's no wonder why Dyson vacuum cleaners are so popular. Two of these models are featured on our list of the best bagless vacuum cleaners available today. 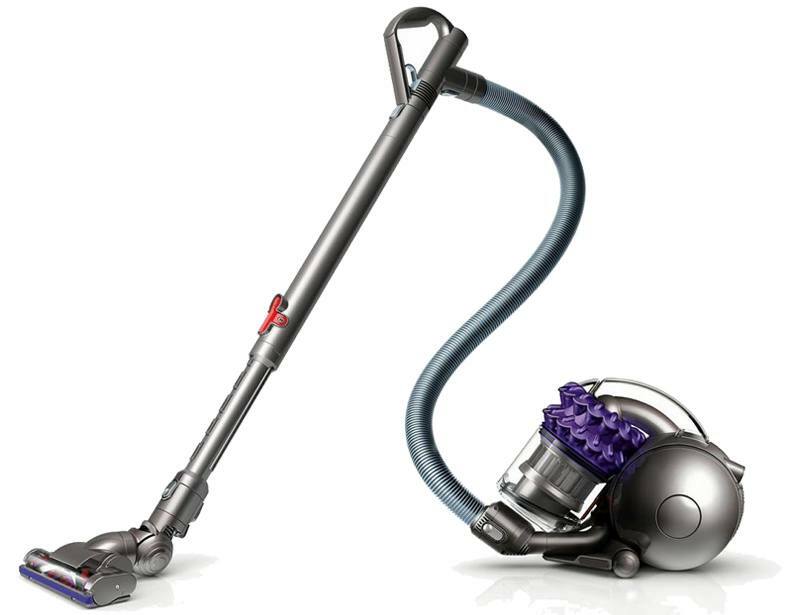 Dyson's innovative Ball technology, featured on all the models reviewed below, allows for maximum maneuverability across open floors, tight corners, and everything in between. For more information, or for assistance placing an order, please call 866-972-8227 to speak with a representative. 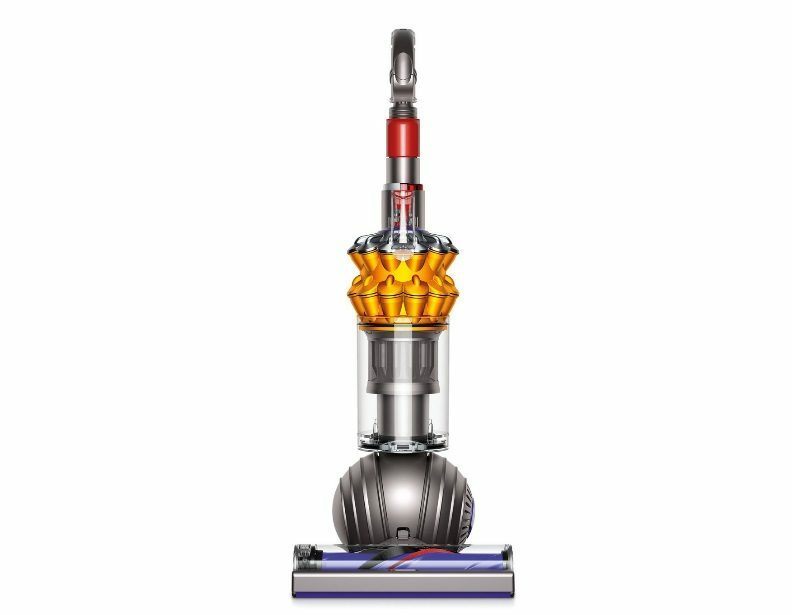 The trademark design of this Dyson Ball Multi Floor upright vacuum cleaner is Dyson's revolutionary contribution to the world of vacuum cleaners. 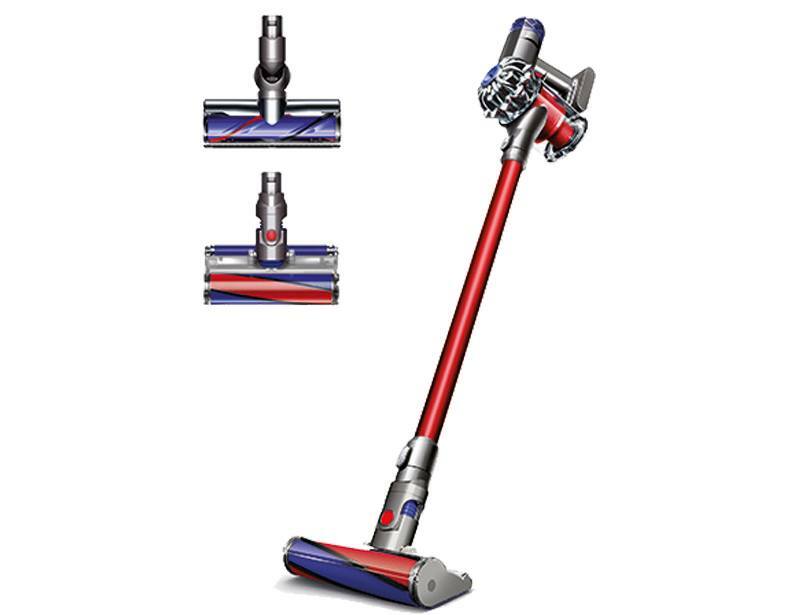 Dyson's ball technology allows its upright vacuum cleaners to swivel and to maneuver in ways that traditional upright vacuums cannot for easy cleaning of tight corners and around furniture without needing to swap attachments. This model features a self-adjusting head for strong cleaning on any surface. And because it's bagless, there are no bags to buy or change-- when the dust cup is full, simply remove the cyclone assembly and push the button to release dirt into the trash. "This machine cleaned what we thought was an already clean carpet to a level we hadn't experienced before. We did not realize the level of dirt being left in our carpet by our other vacuum. 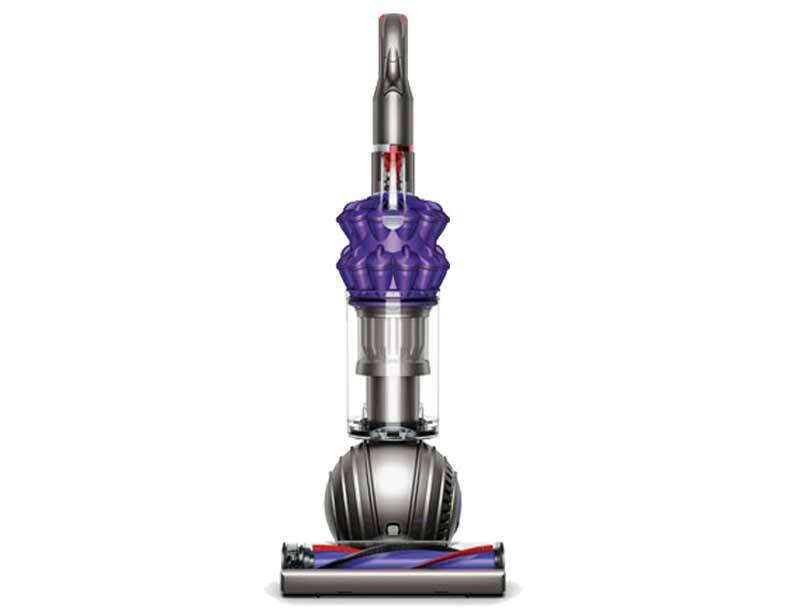 We are sold on the Dyson Ball Multi Floor vacuum." -ColleenR, Dyson.com user. The Dyson Small Ball upright vacuum cleaner may be 50% smaller than a full-sized vacuum but that doesn't mean it sacrifices performance for compact storage. In fact, the Small Ball has been re-engineered with a reversible wand and long cord to provide a 25% longer cleaning reach than traditional uprights. Designed for all floor types, the direct drive cleaner head features soft nylon bristles for carpet and anti-static carbon filaments to remove fine dust from bare floor surfaces. "The Dyson Small Ball Multi Floor is my new favorite vacuum! From the moment the vacuum arrived, it has exceeded my expectations. First, the Small Ball Multi Floor was very easy to assemble. Secondly, I have been impressed with how it works on pet hair. From rugs to hardwood floors to furniture, the Small Ball Multi Floor pulled up even the most resistant dog hair. The suction was great, and my rugs are cleaner they have been in years. Finally, the small ball keeps the lightweight and compact design I love, and since it is even small than previous models while maintaining all of the owner, I can store it in my closet allowing me easy use in the most traveled areas of my home." - ANS5615, Dyson.com user. 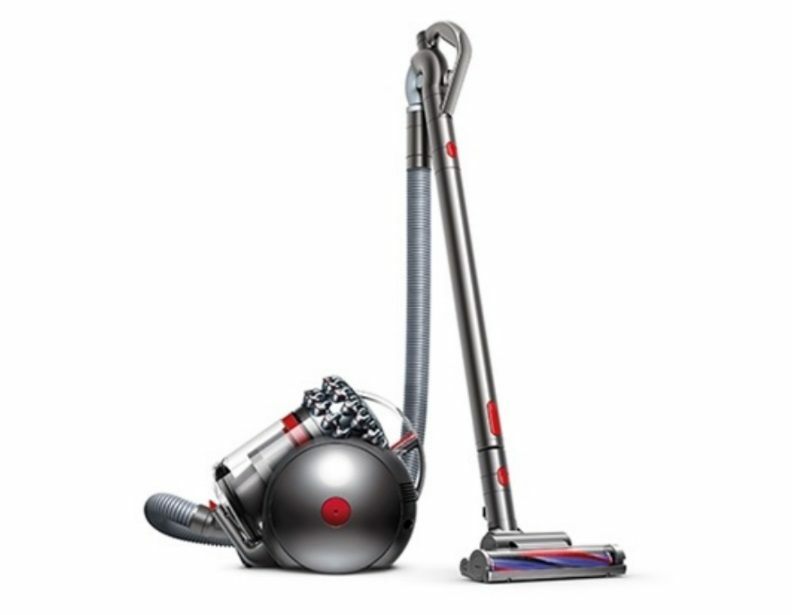 The Dyson Ball Compact upright vacuum cleaner is Dyson's smallest vacuum cleaner. 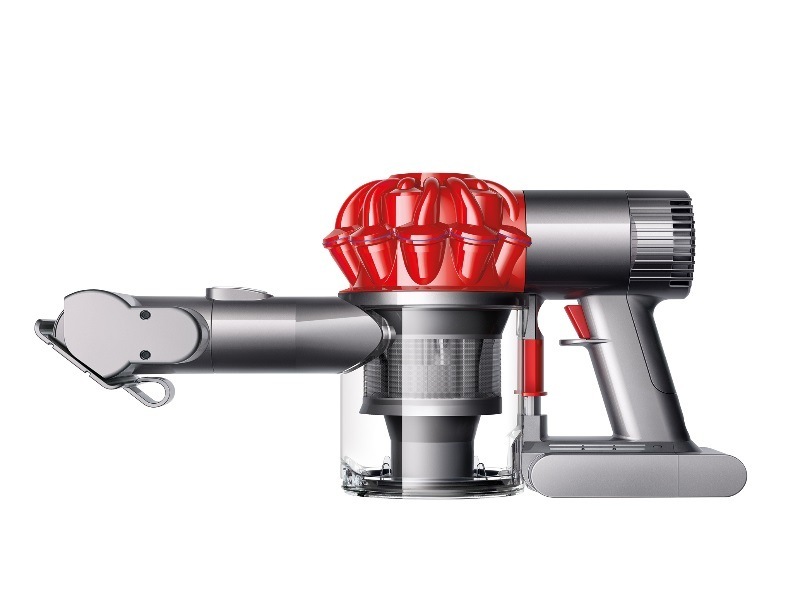 To fit maximum suction capabilities into this small package, Dyson meticulously re-engineered this vacuum cleaner to give it the same powerful performance of a full-sized upright vacuum. Its telescoping handle can be adjusted for compact storage or to suit your needs while cleaning. 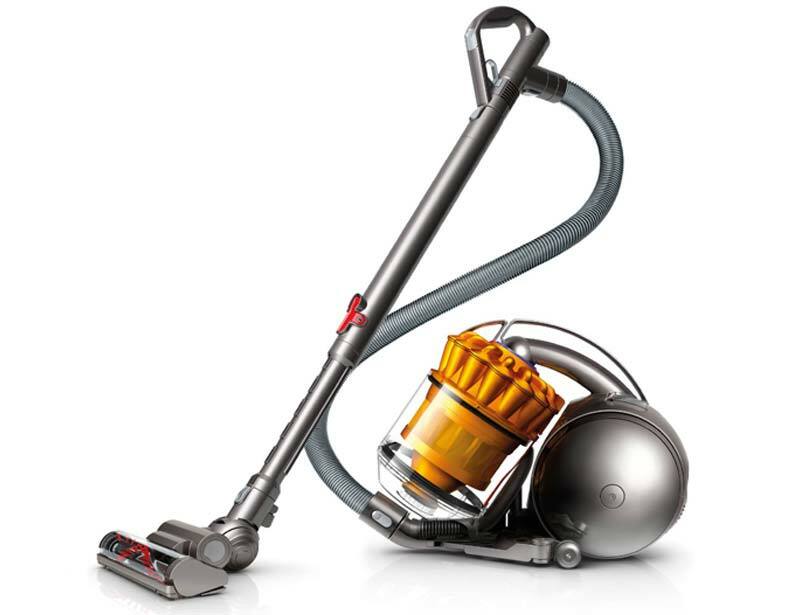 "It is the most amazing vacuum I have ever owned. The amount of dust and cat hair it picked up was stunning. When I saw how much dust it picked up weekly off the rug and floors, I went out and bought an air filter/purifier. Definitely worth every penny and then some." -MP1978, Dyson.com user. 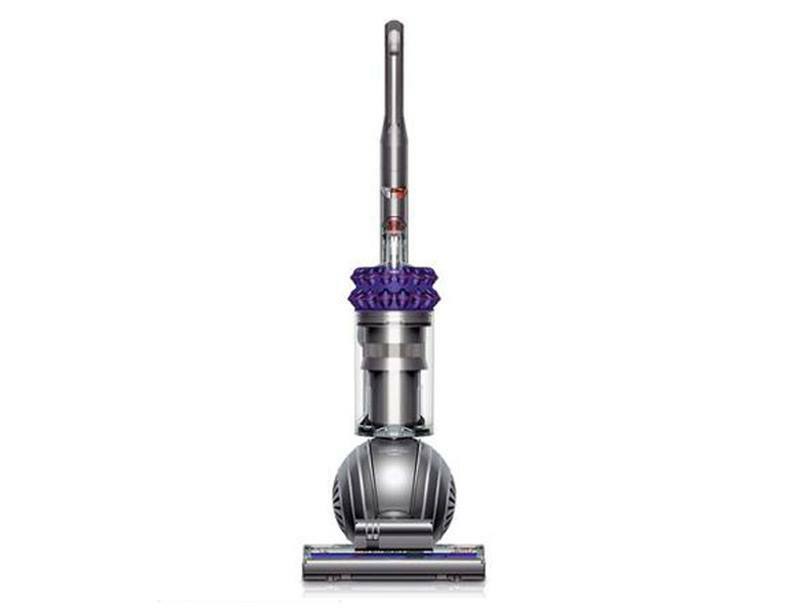 As its name implies, the Dyson Cinetic Big Ball Animal upright vacuum cleaner is an ideal choice for homes with pets. 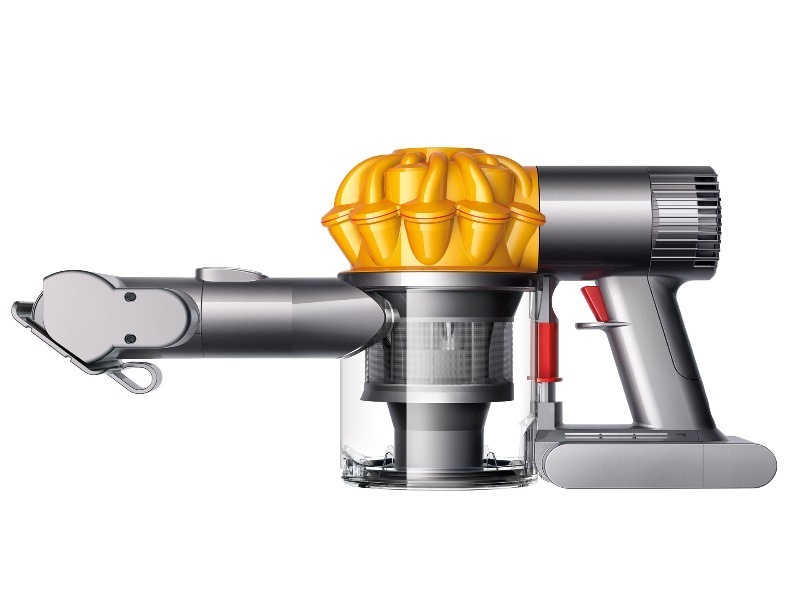 The Big Ball Animal upright vacuum cleaner comes with Dyson's tangle-free turbine tool, which removes hair from carpets and upholstery without the risk of tangles or clogs. 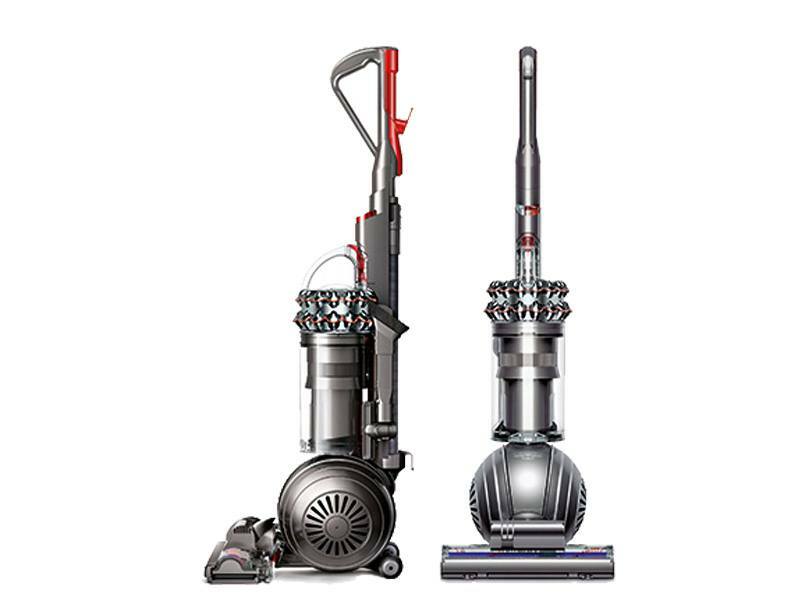 Dyson's Cinetic technology so efficiently traps dust that this vacuum cleaner doesn't require filters. 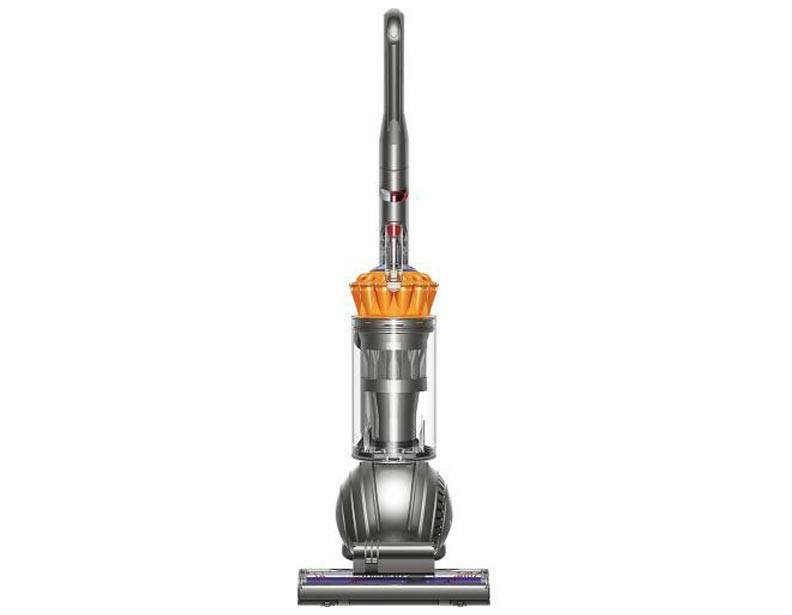 "The best vacuum I have ever used or had in my life! Can't beat the tools and tool bad that it comes with. It's worth paying the extra for this new model! And no filters to rinse... yay!" -hill3299, Dyson.com user. For good reason, the Dyson Cinetic Big Ball Animal Allergy upright vacuum cleaner earned the top spot on our list of the best bagless vacuum cleaners available today. The Cinetic Big Ball Animal offers strong suction, versatility, great maneuverabililty, and requires little maintentance. In addition to being bagless, this model does not require filters. "It is an amazing vacuum! Not only is the cord really long ... but the amount of dog hair it got out of the carpet (which is only 5 yrs old) was amazing. And it didn't clog! Had to empty the bin a lot, but after a week of vacuuming every other day, we can now vacuum the entire house and only have to empty the bin once. Very impressed! AND! Our dogs were always afraid of our other vacuums due to how loud they were. Not so with the Dyson." -Jen67, Dyson.com user. The Dyson Ball Allergy upright vacuum cleaner is certified asthma- and allergy-friendly by the Asthma & Allergy Foundation of America. 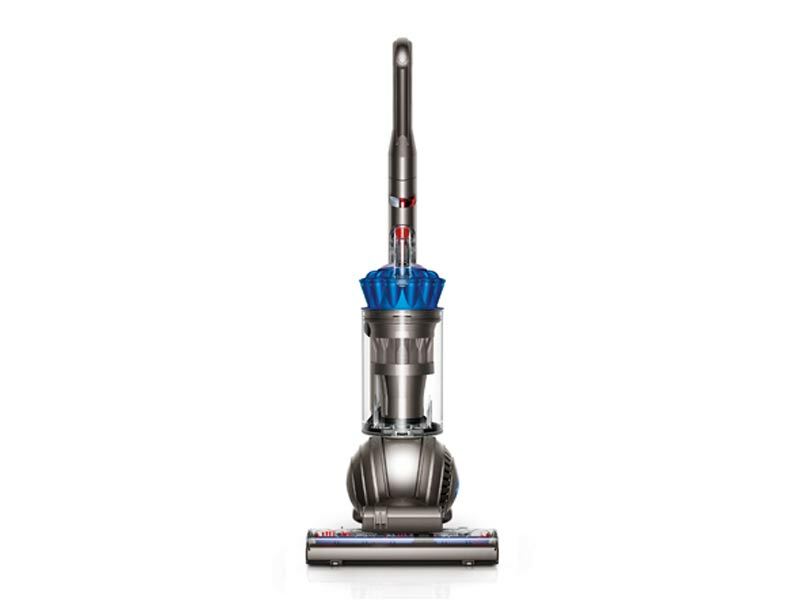 This vacuum's self-adjusting cleaner head gives you powerful suction on any surface, and transitions seamlessly between different floor types. "We purchased the Allergy model because of the dust out here. It works like a charm. It brought up more dust than our old model. This will help us as we both have allergies to pollen and dust. We are very pleased and would recommend this model to anyone with allergies." -Kero65, Dyson.com user. 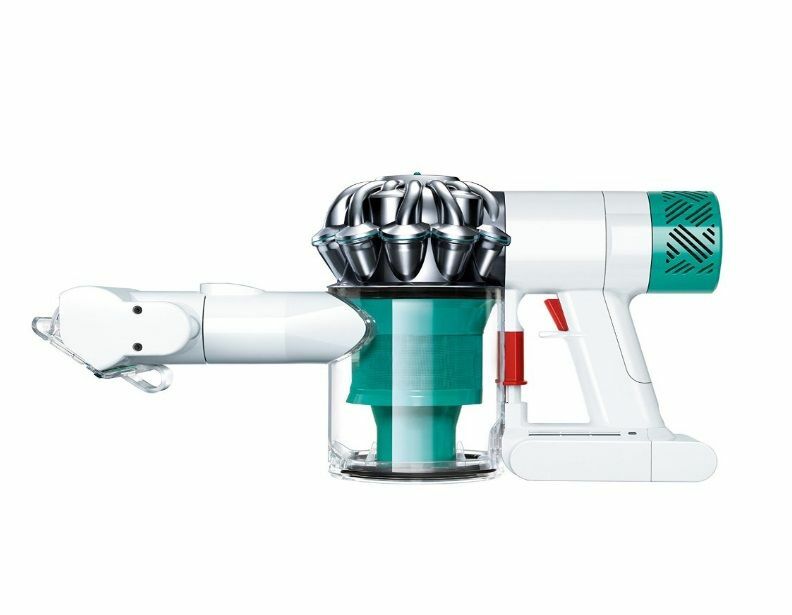 The Dyson Ball Compact Animal canister vacuum cleaner offers Dyson's maneuverable Ball technology in a lightweight and versatile canister configuration. The included tangle-free turbine tool makes the Compact Animal canister vacuum an ideal choice for homes with pets. This bagless canister vacuum offers the same hygienic and convenient bin-emptying technology as its upright counterparts. 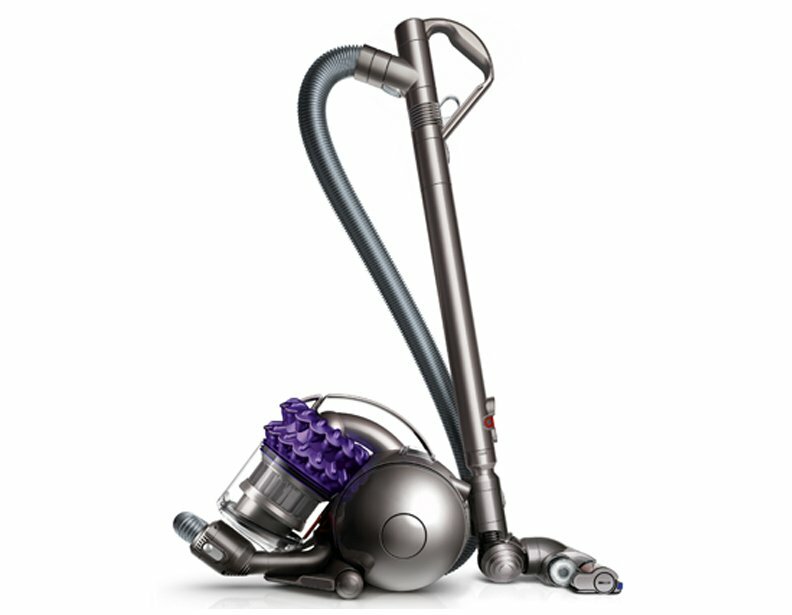 This Dyson Ball Multifloor canister vacuum cleaner offers powerful suction and Dyson's patented cyclone technology with a lower noise output. The Dyson Ball Multifloor canister's soundproofing technology makes it one of the quietest vacuum cleaners in its class. Its clear bin allows users to tell at a glance when it needs to be emptied. 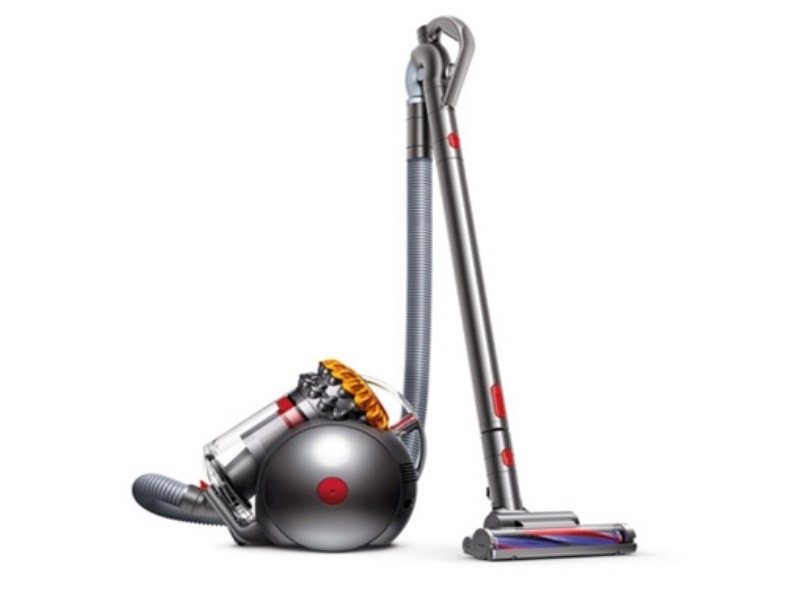 Equipped with patented 2 tier radial cyclone technology, the Dyson Big Ball Multifloor canister vacuum cleaner systematically separates dirt and debris from the fast-flowing air stream via two sets of cyclones stacked on top of each other. One of the only Dyson canister vacuums that stands itself up after a topple. 3 way articulating handle provides fluid maneuverability to ensure 360-degree coverage of all areas of your home. Thanks to Dyson Cinetic science, this Big Ball Animal canister vacuum cleaner so efficiently directs dust into its bin that no filters are required. This vacuum cleaner has a sealed system to ensure that its dirty air is not exhausted back into your home. Standard attachments include the combination brush and crevice tool, stair tool, and tangle-free turbine tool. all corners of your home. Large, transparent dust cup allows you to monitor dirt intake as you vacuum. Carbon fiber turbine head works wonders on pile carpet and smooth floor surfaces. A great addition to any busy home. 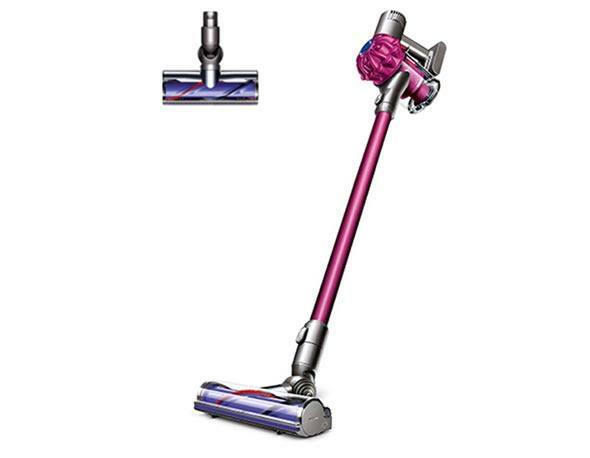 The lithium ion battery in this Dyson V6 cordless vacuum cleaner allows up to 20 minutes of continuous suction. 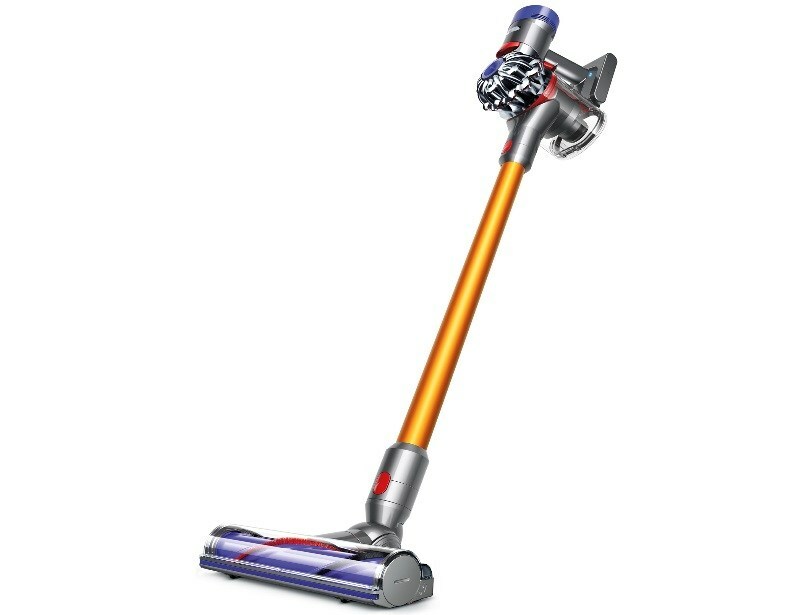 For added balance and maneuverability, this lightweight vacuum cleaner's center of gravity is located towards its grip. This makes easy work of messes floor to ceiling. Its versatile cleaning head easily cleans both bare floors and carpeting. "Very easy to use. Extremely light and battery holds out for a while under normal suction setting. Makes this a great product for my place (only 2 rooms). I would not recommend this for a large home, either get 2 or upgrade to a bigger size. The vacuum power is better than I expected and disposal makes it easy to clean out. Overall, I'm very pleased with my Dyson V6." -Kanjiru, Dyson.com user. 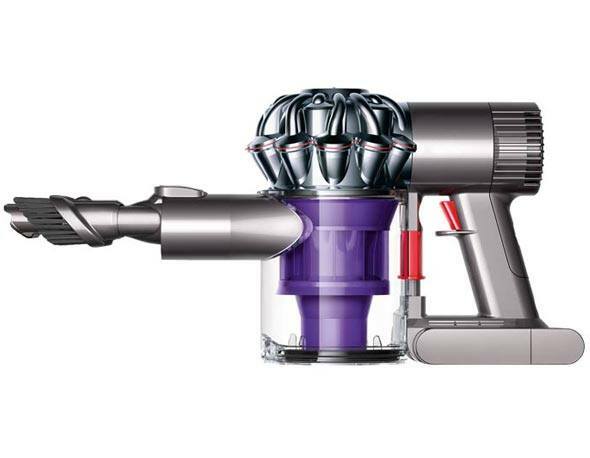 The Dyson V6 Motorhead cordless vacuum cleaner features a direct-drive deep cleaner head, which gives it 75% more power than standard Dyson cordless vacuum cleaners. The two different types of bristles in this head effectively clean both bare floors and carpeting. The Dyson V6 Animal cordless vacuum cleaner utilizes a strong direct-drive cleaning head that thoroughly cleans both hardwood floors and carpeting. A clear dust bin allows you to tell at a glance when it needs to be emptied. To empty its bin, simply hold this cordless vacuum over a trash can and press the button on its handle. "First, it was easy to assemble; diagrams easy to understand. The DC59 is so very versatile. Great electric cord keeper to the docking station. Great Suction on the "Powerful" mode and Super on the "Boost" mode. The swivel is very easy with a wide swing. The "lite" weight is a big plus. It is very easy to clean, just wipe off with a damp rag, one (1) filter to clean, and the dirt cup all comes apart for easy cleaning. The tool storage is very convenient also." -alhw, Dyson.com user. 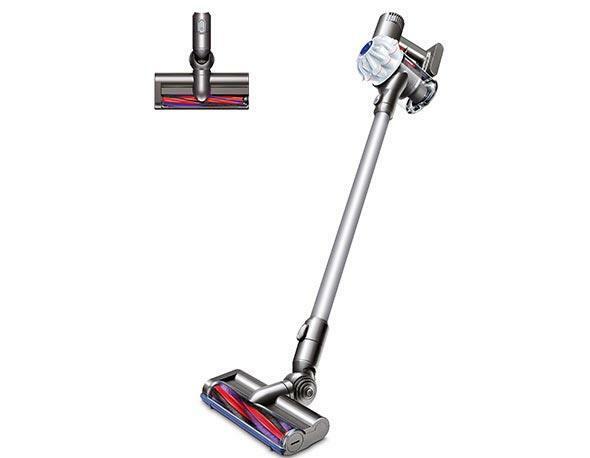 For the ultimate versatility, this Dyson V6 Absolute cordless vacuum cleaner includes two different heads and easily converts to a hand vac. Its soft roller cleaner head was invented to both fine dust and large debris from hardwood floors, and its direct-drive cleaner head was engineered to push its bristles deep into carpets for a thorough clean. This model's HEPA filtration system effectively removes 99.97% of particles to 0.3 microns from the air in your home. 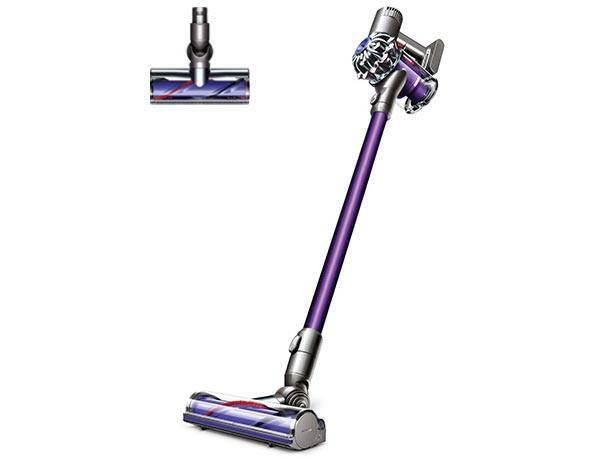 Improving upon the Dyson V6 design, the Dyson V8 Absolute cordless vacuum cleaner provides operators with 40 minutes of fade-free suction power and a powerful max mode that increases suction power for more difficult tasks. Transparent debris bin allows users to measure dirt intake while vacuuming. Can handle 0.14 gallons of dirt and debris. Converts into handheld for on-the-go cleaning. Convenient docking station holds cordless vacuum and additional attachments when not in use. "WOW!! I thought our house was clean until I used this vacuum!! It was fabulous in every way!! It is light, powerful, easy to use and easy to empty. It lasted our entire cleanup and amazed me how much gunk it picked up in the short amount of time it took to clean!! We love to do quick hits at our house instead of long drawn out cleanings so it fits our style perfectly!!" -LesChris, Dyson.com user. Engineered to operate at whisper quiet decibel levels, the Dyson V6 Baby and Child handheld vacuum cleaner is a great addition to any household with toddlers or infants. Its run time of twenty minutes makes this handheld vacuum perfect for quick pickups. Comes equipped with four attachments for all your cleaning needs. Need to clean the crib? Attach the wide upholstery tool. Time to pick up crumbs in the carriage? The elongated crevice tool should get in-between those tight folds in the fabric. If you need more suction power, you can always press boost mode and the watts will sky rocket from 28 to 100! 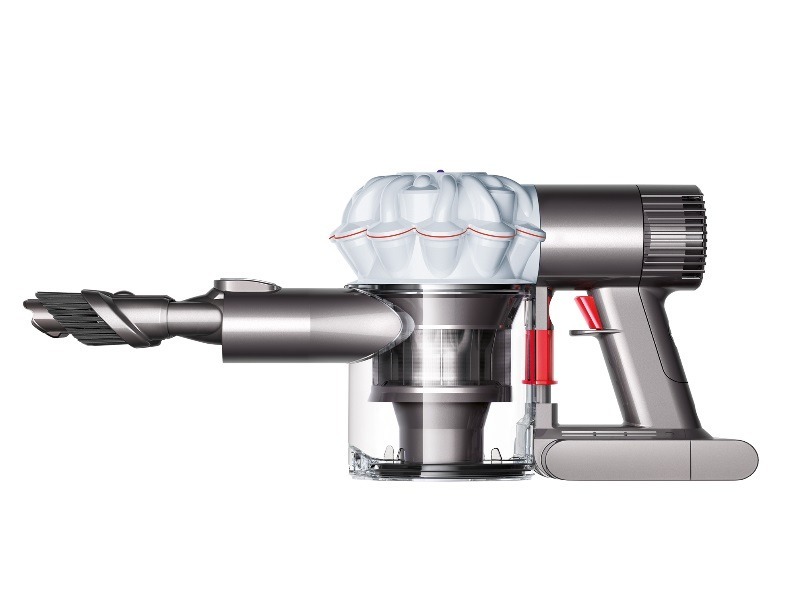 Perfect for cleaning your car or boat, the Dyson V6 Car and Boat handheld vacuum cleaner offers 20 minutes of fade-free suction powered by a strong lithium ion battery. Boost modes increases suction power for more difficult tasks. In step with Dyson's commitment to superior indoor air quality, the V6 Car and Boat comes equipped with patented cyclonic technology that systematically seperates dirt and debris from the fast flowing air stream. For a better night's sleep, the Dyson V6 Mattress handheld vacuum cleaner is designed to remove dust mites and dead skin cells from your mattress. This model's HEPA filtration system captures 99.97% of particles as small as 0.3 microns, and expels air that is cleaner than when it went in. With 20 minutes of continuous suction, you'll be able to vacuum your mattress and much more before this hand vac needs recharging. "I highly recommend this V6 Mattress for the following reasons: HEPA filtration!! High suction, easy to use, all (newer) Dyson attachment tools can be used, Very effective (wait until you see the ick removed from your mattress), the on/off trigger has a light touch and is very easy to keep engaged, and lastly it's aesthetically pleasing.. I love the white and teal color scheme. Also, the above floor cleaning possibilities are huge.. I clean the furniture, drapes, dust tables, clean knick knacks and it does a great job cleaning the interior of the car! I mostly appreciate the HEPA filtration, with my asthma and allergies, I can breathe easy and don't sneeze while vacuuming. I (honestly) highly recommend the V6 Mattress!" -HonestJoe68, Dyson.com user. Designed for those with four-legged furry friends, the Dyson V6 Top Dog handheld vacuum cleaner features a mini motorized tool that buffers away dirt and debris that cling to couches and beds. Offers 20 minutes of fade-free suction powered by a lithium ion battery. Debris can be tracked with the naked eye thanks to the transparent design of the dust cup that holds 0.12 gallons of debris. Comes equipped with 2 year manufacturer's warranty. The ergonomic design of this Dyson V6 Trigger handheld vacuum cleaner makes it an ideal choice for cleaning car interiors, kitchen countertops, and other areas that are off limits to a traditional vacuum cleaner. This model's "boost mode" offers six minutes of ultra-powerful suction when tackling difficult messes. When set to its normal setting, the V6 Trigger offers 20 minutes of continuous suction time. "We got this gem to use in the car and couldn't be happier! It fits into all the nooks and crannies of the car, has the power to do the job, and is not deafening to use! It is perfect for quick pick ups inside the house too!" -Tooltime, Dyson.com user.